Want it fast? Buy it today and you'll receive it most likely on Monday 29/04/19. Details. If you are to order the Cool white option, you will receive a 3w bulb. Requiring a low power usage of just 3 watts and boasting the new OMNI-LED filament technology, the Mirrorstone Lighting dimmable 3w OMNI-LED candle lights will replace your 35w incandescent candle light bulbs perfectly. Also, due to its standard, retro fitting B22 base you can swap them straight over with your incandescent candles and make up to 90% savings on your lighting bills rapidly for over a decade as their life expectancy exceeds 30,000 hours which is equivalent to over 10 years considering an average usage of 8h per day. This huge running cost reduction is also accompanied by the frequently ran discount codes which range from up to store wide 10% discount to a 20% off of selected products. Whatever the discount being ran, you can always benefit from up to 20% additional discount. Likewise to the discount codes you can also gain an extra 5% discount when ordering 5 or more with our bulk buy offers. This can total for up to 25% initial discount whilst still experiencing vastly reducing running costs. Every 3w OMNI-LED Candle comes with 2 sole LED filaments which emit a high power light. This is also amplified by the clear glass finish to get the truest impersonation of 40w incandescent candle. These 2 individual LED filaments make the 3w OMNI-LED candle have a full light spread of 360° as well as a bright light output of 330 Lumens. The bright light output and spread of light is additional to the 2 colour variations that are available with the OMNI-LED range. Available in Warm White (3000K) and Cool White (6000K) you should be able to find a colour that will suit your installation perfectly. If you're looking to install your new LEDs into living areas such as your dining room then Warm White is the general recommendation for light colour. Warm White is also recommended in hallways and bedrooms for a more relaxed light. Warm White is also recommended in rooms which have are more traditional styling. If you don't think Warm White is the right effect for what you're looking to do then the other colour option, Cool White, may be the better choice. Generally recommended for use in bathrooms and kitchens you may find that Cool White is better for rooms which require as much light as possible. It is also a good choice for any rooms which have a modern styling to them. If you still don't feel entirely sure about what colour you would need or want then refer to our colour guide for more help. Sporting a full range of Globes, Candles and Golf balls in standard E27, E14, B22 & B15 fittings our new OMNI-LED range has something that should suit you. When LED bulbs first surfaced they used SMD LEDs to get their light output. As SMDs are surface mounted you could only achieve a 180° beam angle from the light. Despite this beam angle being wide, it doesn't replicate the incandescent light bulbs as well as it could do. We have took an original LED Light bulb apart digitally to display how it works. OMNI-LED Technology makes LED light bulbs get closer than any SMD bulb before it with the help of its LED filaments. The LED filaments allow for omnidirectional light output meaning that the bulbs can achieve a full spread of light as oppose to a 180° beam. Our OMNI-LED range manufactured by Mirrorstone also consists of a smaller range dimmable OMNI-LED bulbs. These bulbs are dimmable as standard but it isn't necessary for them to be dimmed and you have the option of making them dimmable if you do wish to. For dimming the range of dimmable OMNI-LEDs you will need to install a dimmer switch that is compatible with LEDs. There are a range of companies who have, or claim to have, LED compatible dimmer switches, however we only guarantee that the Varilight V-Pro and V-Com lines are compatible with our LEDs. If you already have a switch installed then you can check to see if would be compatible and seeing if it is a Low Load Trailing Edge Dimmer Switch. Our full range of Mirrorstone products are covered by a comprehensive 2 year warranty. This warranty is also fully extendable out to 5 years in all LED spotlights, LED Light Bulbs and LED tape within the first 90 days of purchase. 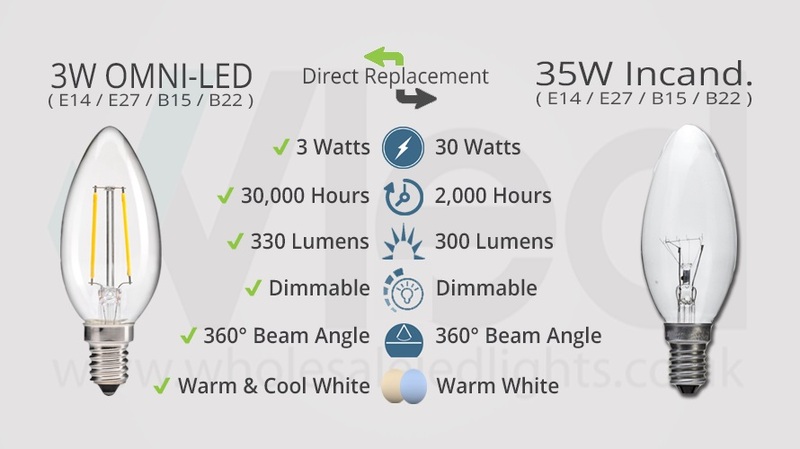 If you have any questions in regards to the 5 year warranty, OMNI-LEDs, wholesale rates, trade offers or dimming LEDs then please don't hesitate to get in contact with us by telephone on 0116 321 4120 or by e-mail on cs@wled.co.uk. Packaging poor causing one bulb to be broken in transit , otherwise ok. These are fine in my opaque globe shade ( triple fitting). Good bulb at good price, but swapped for warm white version as cool white too 'blue'. Very Good. They say 35W equivalent but for the first time with low wattage I think they have underestimated. I have replaced two 60W bulbs and they are just about as bright. So I am very happy. Work well on full power but there is a point where they flicker when dimmed.